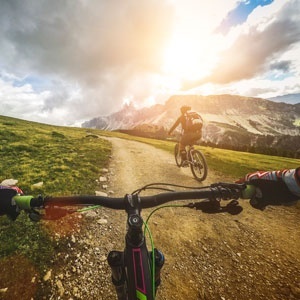 Cape Town - Cyclists and enthusiasts who also love wildlife safari getaways, can rejoice – you’ll now be able to enjoy mountain biking at Samara Private Game Reserve in the Great Karoo. With an option to choose between guided and unguided mountain biking tracks, guests will now be able to trail bike across the game reserve's 70 000 acres of wilderness. According to Samara, the guided routes are in the game-fenced area where riders will be accompanied by a Samara ranger. Non-guided routes are also available in the nature reserve, however removed from the dangerous game. To ensure a safe and enjoyable experience, riders will be given a radio and a map to guide them along the route. Experienced bikers can enjoy the Samara Mara Cycle Route. The route covers 33kms with a 656m total ascent. The cycle route meanders to the top of the Kondoa Mountain where riders are likely to encounter eland, Cape mountain zebra and gemsbok grazing in the plateau grasslands of the Samara Mara framed by purple mountains. Riders head back to the lodge via the Wolwekloof descent. The laid-back Milk River Cycle Route is 12km. The route features riverine forest along the meandering Milk River and takes riders through dry riverbeds and open plains where they may spot monkeys, antelope and aardvark. This route is not technical and is open to bikers of all abilities. Packed picnics can be arranged or riders can join the rest of their party for a mountain-top picnic lunch. Afterwards riders can either take a leisurely game drive to the lodge or cycle back. The Vulture Mountain Cycle Route is 44km with a 676m total ascent. This is a technical ride for experienced riders. They will take in the magnificent views of the Plains of the Camdeboo from atop Vulture Mountain before heading back to the lodge. The Wild Olive Grove Cycle Route is a 20km and winds through valleys and riverine forest leading to the grove 1000 year old wild olive trees. This route is gentle, not technical and is open to bikers of all abilities. Packed picnics can be arranged on request for the non-guided tracks.